We are proud to announce a new partnership with Quality Clouds, the non-invasive cloud-based software for governance and code-review of SaaS platforms. Quality Clouds (QC) specialises in empowering businesses to develop higher calibre cloud-based software, faster and more efficiently. Its customer-base is primarily composed of companies that use Salesforce, the market-leading CRM platform employed by over 150,000 businesses worldwide. Salesforce is designed to be easy to set up and customise, but QC has found that many companies don’t use the platform in line with best practices. Internal IT teams tend to build applications that add various adjustments to the base Saleforce system, without truly understanding how these changes affect the platform's architecture. These apps work fine, for a while. But when it's time to scale the application or upgrade Salesforce, companies find themselves forced to rewrite reams of code. This laborious task could be avoided if best practices were followed from the start. QC checks the health status of your current implementations, identifying risks, and proposing remediation plans within minutes. QC makes certain your platform is fighting-fit to grow alongside your business and app performance is always optimised. With multiple teams and partners working in the same Salesforce environment, QC gives you full visibility into what partners are implementing and ensures they're also following best practice. 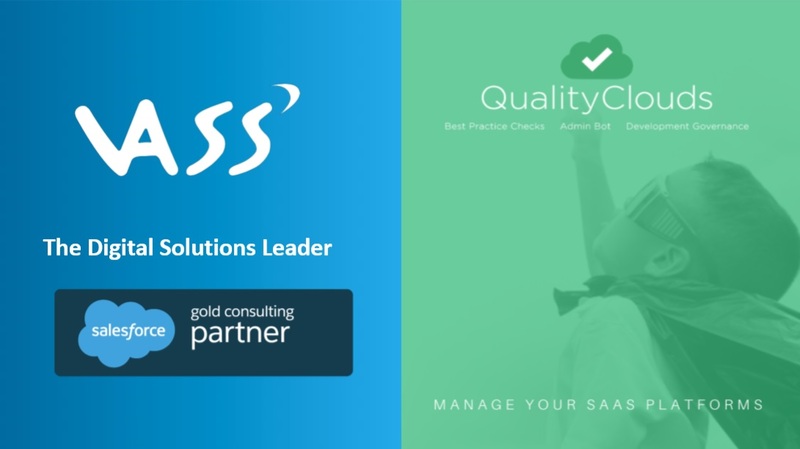 As for VASSIT, we're delighted to be Salesforce Gold consulting partners, with over 135 certifications and 10+ years of Salesforce experience. Our client satisfaction rating is 9.5/10 and our commitment to delivering for our customers is uncompromising. This all means you can expect the highest level of support and reliability, and outstanding results, when you choose VASSIT and QualityClouds to manage and optimise your Salesforce apps. The value for businesses is clear: Quality Clouds saves you time and money while improving the performance and longevity of your cloud applications. Add VASSIT into the mix, with our vast experience of agile working and certified Salesforce expertise, and that value only increases. We can't wait to begin offering this fantastic solution to our customers. For more information about how VASSIT and Quality Clouds can help your business, get in touch today.